Our gums/gingival might be hurt by a foreign , sharp object. Your dentist might not remove completely plaque and subgingival calculus. Normally after scaling, there will be a tight cuff around the gingival margin, this might occlude bacteria inside the deep pocket. 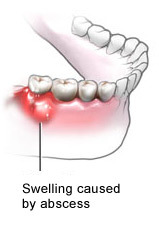 Inflammation due to excessive occlusal stress such as traumatic injury to the tooth, excessive orthodontic force. During root canal treatment, there might be a perforation on the walls result in spreading of bacteria infection to the periodontal tissues. Diabetic patients have higher occurrence of periodontal abscess. So what symptoms will I face if I have periodontal/gum abscess? You will feel pain when you bite. You will feel that your tooth is elongated in the socket. Your tooth might be mobile. Collection of pus might cause your gingival to look red, shiny and tender. The abscess might discharge and you feel a bad taste. Increased in your body temperature and nearby lymph nodes might be swollen. How do we know whether an abscess is due to a pulpal origin or a periodontal origin? If the abscess is located at the apex of a tooth, it is most likely from a pulpal origin. 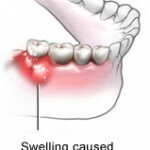 We suspect an abscess to be a periodontal abscess if there is deep pocket and bone loss involved. If the tooth is filled with huge restoration and you might feel sensitivity during hot and cold drinks, it might be inflammation involving the pulp. If your dentist places a small electric current on your tooth surface and you feel an electric shock feeling, the abscess is due to periodontal disease. How do we treat gum/periodontal abscess? 1st of all, we need to determine the prognosis of the tooth, if the prognosis is bad, we can perform extraction on the tooth. 2nd, relief the pain and prevent spreading of infection. This can be done by draining the abscess. Draining the abscess can be done from the pocket itself. If there is pus discharging freely , we can ease the discharge by giving local anesthesia or topical anesthesia around the tooth, or a regional /general anesthesia if the abscess is huge. Then a probe is introduced inside the pocket and we can try to ease the pus out followed by irrigating with saline. Other than using probe we can use a curette to remove any kind of granulation tissue and draining the pus. If there is no pus discharging freely,the dentist will make an incision through the most fluctuant part of the abscess. He will use a elevator to elevate the tissue so drainage can be done. After he feels that pus has all drained out, he will irrigate with saline . You should rinse with 1 table spoon of salt in a glass of warm water to reduce inflammation and promotes healing. Antibiotics is prescribed when there is swelling on the face, swelling of the nearby lymph nodes and increased in body temperature. Normally Amoxicillin 250mg, Metronidazole 200mg is given for 3 days. If patient is penicillin allergy, Clindamycin 150mg is prescribed. If everything is stabilized, scaling and root planning can be done and further periodontal surgery can be done. Remember to consult your dentist whenever you think you have a gum abscess before it get worse. Abscess tooth, How Does a Dentist Drain it ?